How do I set a password for a learner in my account? There are two ways to reset a password for a learner. The first option is to use a CSV file. 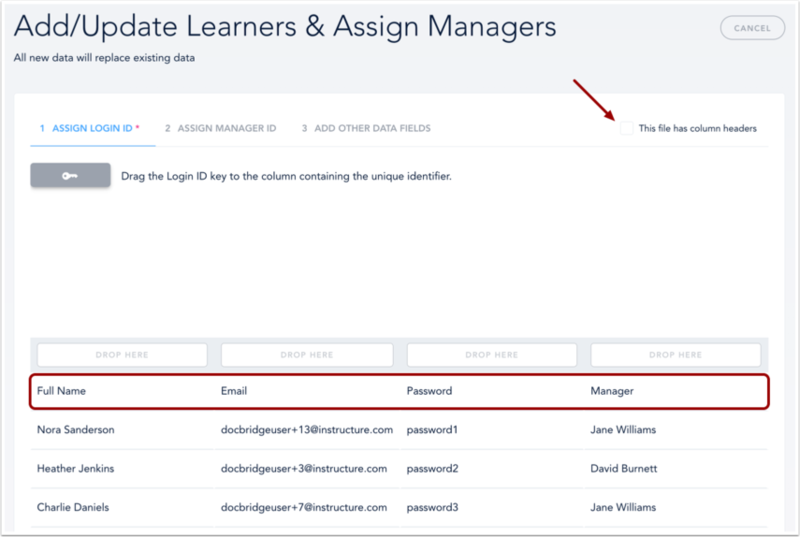 When adding or updating learners with a CSV file, account admins can set or reset multiple learner passwords at the same time. The second option is to use the Password Reset Request. When using the Password Reset Request, the learner will receive an email containing a link that will allow them to choose a new password. The ability to set learner passwords using a CSV file is a setting that must be enabled for your account. Please contact your Customer Success Manager for assistance. Once logged in with the password set by an admin, learners can change their password. 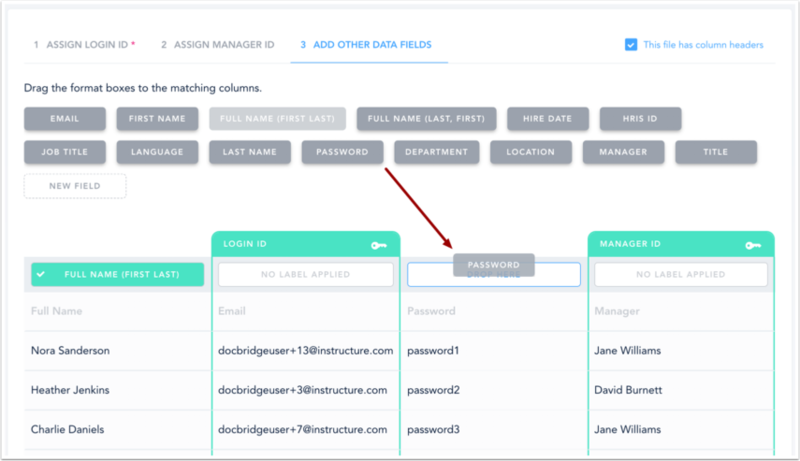 To set a password for learners, include a Password column in your CSV file. 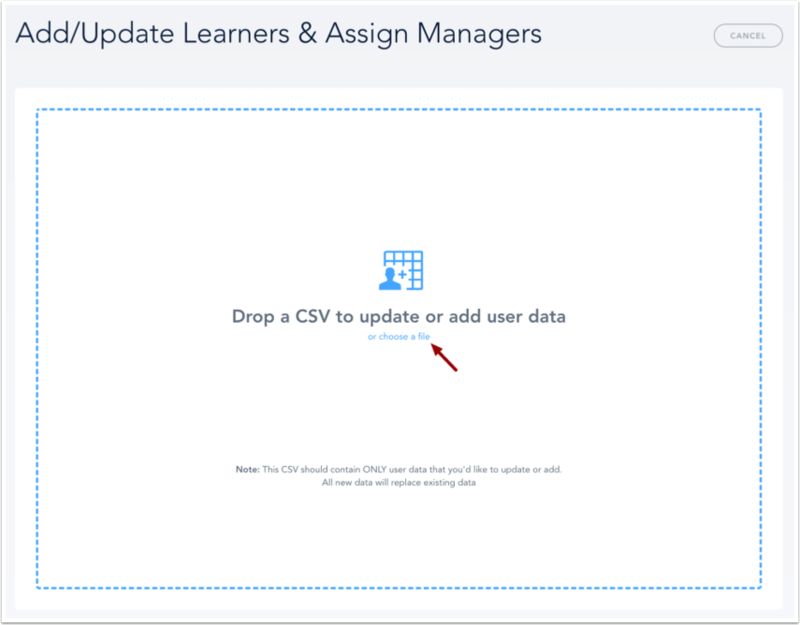 Note: The CSV upload page will only allow you to preview 5 rows of data. 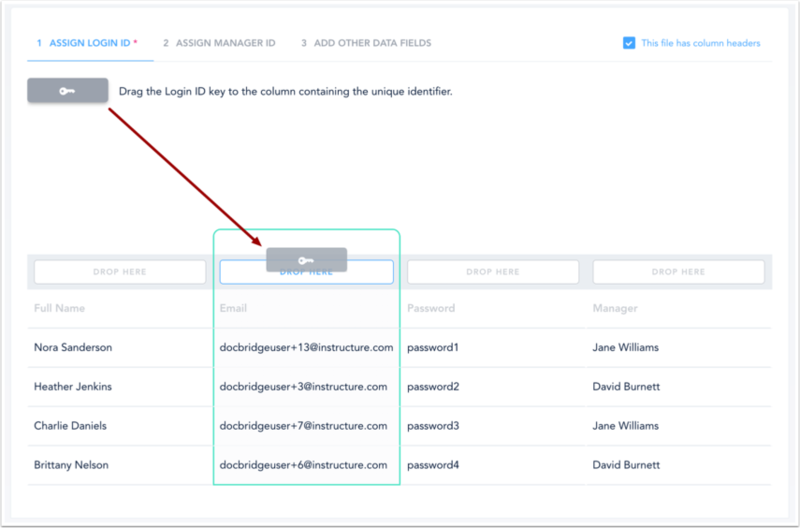 Note: If updating learner information, you will need to drag the Login ID key to the column matching the unique identifier. This step is optional. 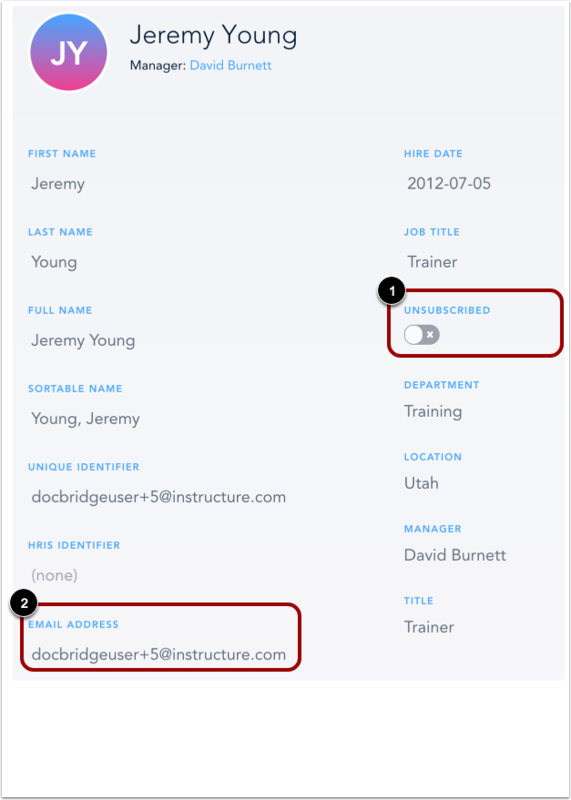 If you are assigning managers, drag the Manager ID key  to the column containing the manager's unique identifier (UID). 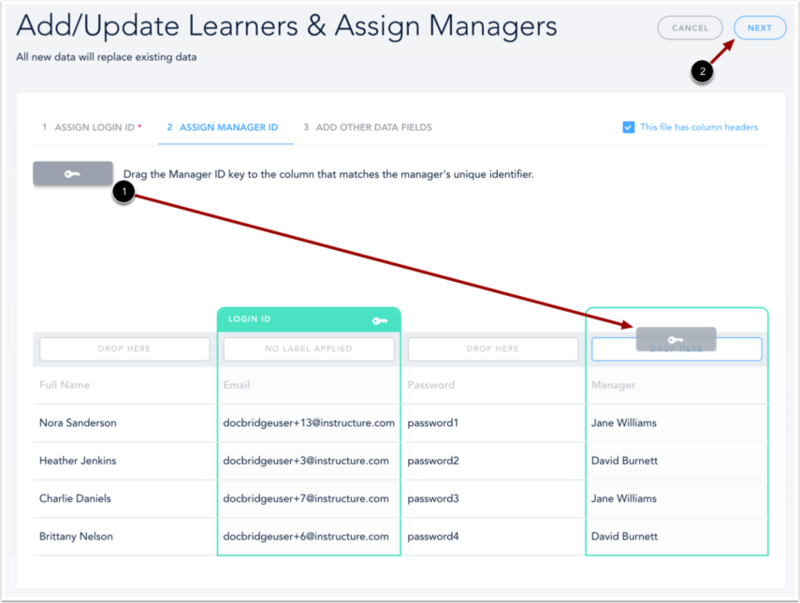 If you are not assigning managers, click the Next button  to skip this step. The manager UID must either already exist in Bridge or be added during the import. 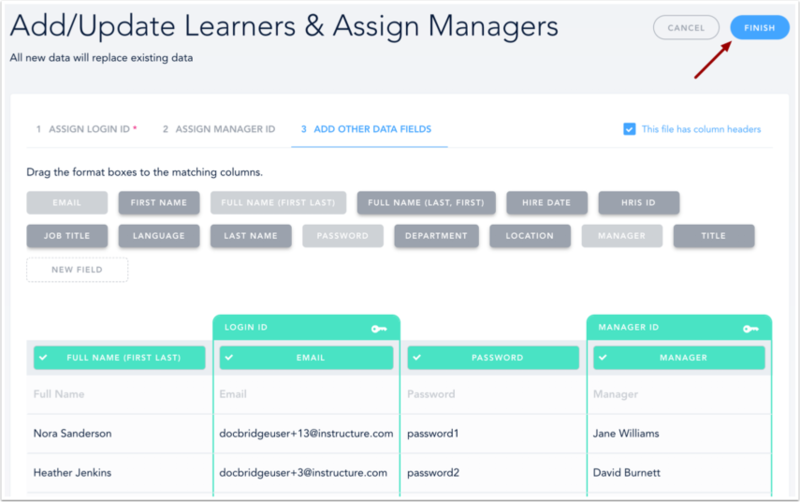 When a learner gets reassigned to a new manager, Bridge will automatically update the learner's course and smart group enrollments. Any courses the learner has not started will be removed and any courses in progress will be made optional. Note: The password format box will only be visible if you have the Set Learner Password setting enabled for your account. Please contact your Customer Success Manager for assistance. 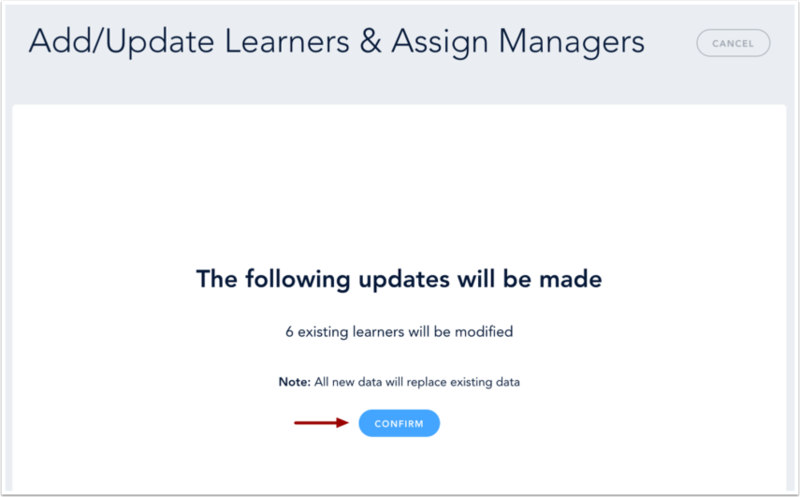 Note: If you make updates to learners who already exist in Bridge, the confirmation message will display "X existing learners will be modified". On the Users page, click the name of the learner you wish to send a Password Reset Request. 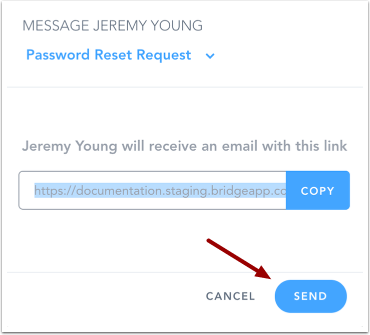 If no Message icon displays, click the Edit User button, and ensure the learner is subscribed to notifications  & has an email address entered . 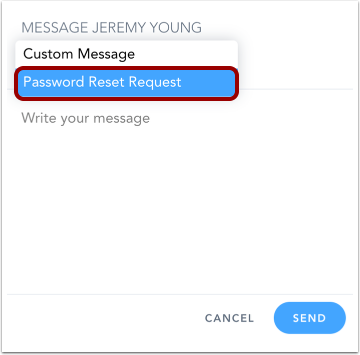 Select the Password Reset Request option from the message type drop-down menu. The learner will receive an email containing a button that will allow them to set another password. Note: The learner must reset their password within 24 hours after receiving the email. Previous Topic:How do I enroll learners in a group or learning content item with a CSV file? Next Topic:How do I resend a Bridge invitation to a learner? Table of Contents > Manage Users > How do I set a password for a learner in my account?